Obviously, I am a fan which is why my Lee Marvin publisher, Tim Schaffner of Schaffner Press, agreed to publish my bio of him. Unfortunately, he then told me he wanted to take his company in a different editorial direction and we agreed to cancel the contract. Sigh. Fear not as there will be some exciting news on that end shortly. When I’m ready, I’ll post. For now, I toast Mr. Bronson/Buchinski and remember him well as Marvin himself did. So long, Charlie Sunshine. 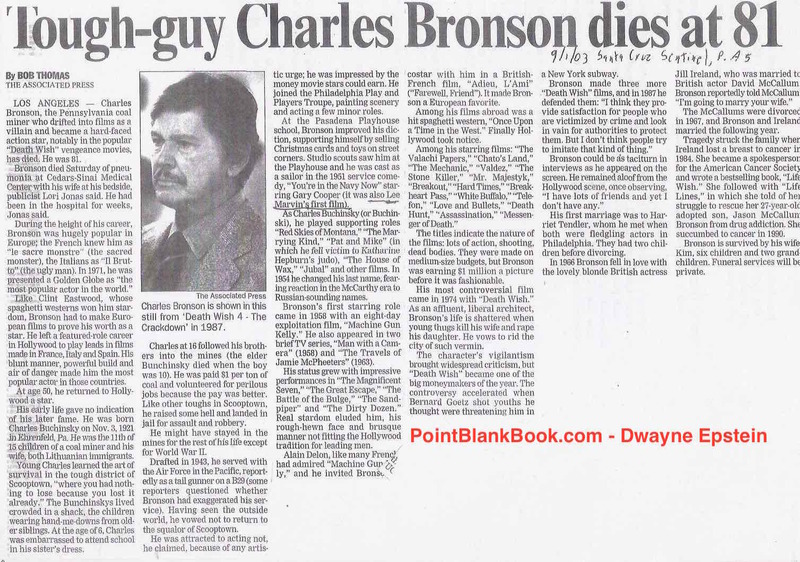 Obituary for Charles Bronson, August 30, 2003. This entry was posted in Uncategorized and tagged Charles Bronson, Charles Buchinski, Lee Marvin, Schaffner Press, Tim Schaffner by Dwayne Epstein. Bookmark the permalink.